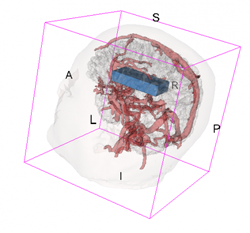 The Resource for Quantitative Functional MRI is an interdepartmental and interdisciplinary laboratory combining MR facilities and expertise of the F.M. Kirby Research Center for Functional Brain Imaging (Kirby Center) at the Kennedy Krieger Institute (KKI) with the computer facilities and image analysis expertise at the Center for Imaging Science (CIS, consortium with Dr. Michael Miller) at Johns Hopkins University (JHU). We also have a consortium with Dr. Brian Caffo of the School of Public Health, who provides expertise in the development novel statistical methods for functional brain imaging. The Resource also interacts closely with the Institute for Clinical and Translational Research (ICTR), funded by a K12 award from NIH to the JHU School of Medicine, and its affiliated neurobehavioral research unit (NBRU) at KKI, headed by Dr. Michael Cataldo. The Kirby Center occupies over five thousand square feet of space at the ground level of Baltimore's Kennedy Krieger Institute's 707 N. Broadway Building, plus another 4200 square feet in the adjacent 716 N. Broadway Building, where the 7T MRI is housed. 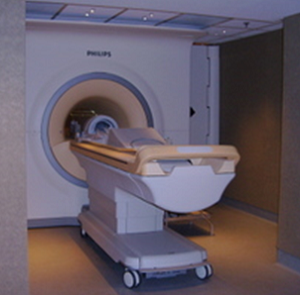 The Center's primary resources are three Philips MRI scanners: dStream Achieva 3.0T TX, dStream Ingenia Elition 3T and Achieva 7T. The maximum gradient strength is 8 G/cm on Achieva 3T, and 4.2 G/cm on the Elition and 7 Tesla. Coils include 32-channel head coils, 8-channel knee coil (also used for neonate brain MRI), flexible surface coils and others. The scanners can perform all modern imaging technologies, including echo-planar (EPI), fast spin echo, navigator echoes, simultaneous multi-slice, compressed sense, single-voxel MR spectroscopy (MRS) and multi-slice spectroscopic imaging (MRSI) approaches. All machines are equipped with parallel imaging capabilities (SENSE imaging), which reduces artifacts in the multi-readout sequences (e.g. EPI-type) used for fast imaging. Through a research agreement with Philps Healthcare, we have access to the development environments for MR pulse sequence and reconstructor programming. Our high-field preclinical and molecular magnetic resonance facility houses two ultra high field MRI scanners, a Bruker BioSpec 11.7T and a Bruker 17.6 microimaging system. These scanners are equipped with state-of-the-art multi-channel RF coils and MRI cryoprobes, allowing high-resolution in vivo rodent imaging for application in life science, biomedical, and preclinical research. A Caliper IVIS Spectrum is also available - an integrated platform that combines optical imaging including Spectral Unmixing, 2D and 3D quantitative bioluminescence and fluorescence with low dose and ultrafast microCT imaging. The facility has a surgical suite for performing preparation procedures for in vivo imaging studies. Expert faculty and comprehensive imaging support services include help with experimental design and performance, and pulse sequence development for innovative MRI imaging, processing, and data interpretation. The Center for Imaging Science (CIS) at The Johns Hopkins University, Whiting School of Engineering occupies 7,500 square feet of space in Clark Hall, home of the Whitaker Biomedical Engineering Institute. CIS utilizes the 250 node, 2000 core, IBM iDataPlex cluster of the Institute for Computational Medicine (ICM) attached to a 1 Petabyte Storage Area Network. The center has access to TeraGrid, a multi-year effort to build and deploy the world's largest, most comprehensive, distributed infrastructure for open scientific research. The TeraGrid includes over 20 teraflops of computing power distributed at nine sites, facilities capable of managing and storing over 1 petabyte of data, high-resolution visualization environments, and toolkits for grid computing. For large memory computational requirements, the CIS infrastructure provides two 32GB/8cpu and three 128GB/16cpu computational servers. The CIS internal infrastructure supports a gigabit network infrastructure to desktop; 120TB of data storage; three tape libraries with a backup capacity of over 210TB; and over 50 visualization workstations. CIS is a member of the Biomedical Informatics Research Network (BIRN), a NIH initiative that fosters distributed collaborations in biomedical science by utilizing information technology innovations. Currently the BIRN involves a consortium of 15 universities and 22 research groups that participate in one or more of three test bed projects centered around brain imaging of human neurological disorders and associated animal models. Through the involvement of CIS with TeraGrid and BIRN, the internal network infrastructure is configured to take advantage of the university Internet2 access point. Internet2 is a consortium being led by 206 universities working in partnership with industry and government to develop and deploy advanced network applications and technologies, accelerating the creation of tomorrow's Internet. The CIS internal infrastructure supports a gigabit network infrastructure to desktop; 40TB of data storage; two tape libraries with a backup capacity of over 60TB; and over 35 visualization workstations. The Johns Hopkins Bloomberg School of Public Health is the oldest and largest school of public health in the world (founded in 1916). It is consistently rated the number one school public health by US News and world report. It receives 20% of all federal research funds to 43 schools of public health. It boasts over two thousand students from over 70 nations. It has a total operating budget of 450 million dollars and ongoing research in over 90 countries. The Department of Biostatistics is one of the key departments of the Bloomberg School of Public Health. Founded in 1918 it is one of the oldest departments of statistical science in the world and the oldest department of biostatistics. The department has a large and well-developed high performance computing cluster with over 200 nodes and three staff members devoted to its management. It has roughly 20 full time tenure track faculty and a similar number of research faculty. The department has a professional service center for biostatistics consulting. The Statistical methods and Applications for Research in Technology (SMART) working group focuses on statistically principled methods for new technologies, with special emphasis on brain imaging, wearable computing, and biosignals. The underlying principle is to develop methods that are automated, fast, scalable, and robust. The Institute for Clinical and Translational Research (ICTR) is a large program dedicated to translational clinical research. Its goal is to expand the working relationships of clinical investigators with basic scientists and population-oriented scientists, to coordinate translational research activities and to increase innovation and speed of translation. The ICTR, through a subcontract to the neurobehavioral research unit (NBRU, headed by Dr. Cataldo) at Kennedy Krieger Institute, funds MRI pilot and research scans for several of the clinical projects. The NBRU is a clinical research unit devoted to neurobehavioral analysis with a special emphasis on rare brain disorders. It offers three major service components: Neurobehavioral Assessment; Neuroimaging; and Inpatient Beds. Enhancing the major service components of the NBRU, and also located in the KKI facility, are the Audiology Department and the Motion Analysis Laboratory.